Five days after a near miss with ice and snow in Northwest Georgia, winter weather followed me across the country last week to the High Plains Snow Goose Fesitval. At least that’s what the folks in Lamar, CO told me as temperatures were forecast to drop precipitously, and the clear sky expected to become heavy with snow. Never mind the fact that I came from the east, and the impending blizzard from the west. As a visitor from afar, I felt obliged to accept the responsibility. And I didn’t feel too bad about it, reckoning that snow was appropriate for a festival celebrating Snow Geese, after all, but a weekend of birding would surely be tough in a blizzard. Fortunately, the snow took its time reaching us, and my first morning in Lamar began with a clear sky and a very pleasant morning walk even if the flickers, juncos and downy woodpeckers that highlighted the outing could have been more easily seen from my kitchen window back on Lookout Mountain. As the winds picked up and the skies darkened later in the day, I experienced a rather ironic high point in the weekend when a couple white-crowned sparrows, and a northern cardinal joined a small flock of juncos we were watching along a riparian zone on the edge of town. All of these species are common in the Southeast, of course, but while the Coloradans in the group oohed over the lone female cardinal, we caught a brief, fleeting glance at a little songbird flashing yellow on its throat as it disappeared into a thicket. Juvenile dickcissel? I wondered. When the little fellow re-emerged and paused for a decent look, there was no mistaking that I was looking at a rather curious morph of a very regular visitor to nearly every bird feeder in the country. A male house finch, usually red around the cheeks and breast, sometimes verging on orange, had shown up looking quite dapper in bright yellow duds. I later learned in an article on the website for Cornell University’s Project FeederWatch that the yellow coloring is not that unusual in the Southwest and Hawaii where the carotenoids that cause the reddening is less present in available foods. In other words, the yellow variation is a normal coloration which every male house finch has the potential to exhibit if given the right diet. Fascinating… if you are into that sort of thing. I found the little guy so beautiful that I might have continued watching him had the wind not picked up, the sky darkened, and a light rain begun to fall. The edge of the storm was upon us. Unfortunately I did not have my camera with me, but my recollection is of a bird with much bolder coloration than the one pictured on FeederWatch.org. Who would have thought I would fly all the way across the country to be wowed by a house finch? I was eager to see what the next day might bring. The next morning I joined about twenty other birders for a half-day raptor watching outing that began with a leisurely and delicious breakfast at Triple T Steakhouse in Grenada, CO. After we were fed, we headed out to a flooded gravel pit along the Arkansas River, stopping along the way when our ever-attentive driver hit the brakes hard and pulled the bus over to the side of the road for us to watch what turned out to be a flock of a hundred or so snow goose decoys. They were so convincing from the bus that, as we pulled away, a gentleman behind me was zooming in on a photo he had taken to convince himself they weren’t alive. The single black leg attaching each one to the ground ended up convincing him. I am still not sure if the driver was in on the joke or not. Raptors were scarce at the gravel pit, but there were several species of ducks including a couple dozen ever-graceful northern pintails that flew in to join several hundred snow geese. I was particularly enamored with the handful of blue morph snow geese in the mix who retained the white head, but were otherwise similar in color (at least to my eye) to great blue herons. Our driver made several more abrupt stops on our return trip to watch a handful of kestrels and redtails, three or four harriers, and one serenading western meadowlark for which I couldn’t resist opening the window, even in the cold, for a better listen. The afternoon following the field trip, I met a group of volunteers to load in and set up for my evening performance. Set up is always a difficult part of a gig for me mentally, as I lay out the “ideal” conditions for the show, and then figure out how to make the best of what is almost always a less than perfect space, and this time was no different. Can we get a black backdrop? Is this the best lighting you can come up with? I really don’t want to keep the house lights on… I’m sorry but one spotlight won’t do it. Do we have to have all these tables? The audience is too far from the stage! Can we rearrange the room? Why don’t we eat in the other room so we can set this room like a theater? This stage is nowhere near big enough; we can’t use it. Somebody get these green M&Ms out of my bowl!!! Fortunately, the team on hand, under the direction of festival director Vince Gearhart could not have been more pleasant, agreeable and happy to acquiesce to my every request, completely rearranging the room twice to create a wonderful space for the show. In fact, Vince’s smile seemed to only broaden with every request I made, and soon I was back in my room rehearsing and resting up for the evening. With five minutes remaining in a performance I was proud of, the house lights flickered, a bright light flashed through the window, and the lights went out. A dim emergency light and the two lamps on stage provided the only vision for the audience, and the final words of Aldo Leopold were delivered by a dim silhouette of a man. Nevertheless, everybody remained seated and quiet as I finished my lines and turned around to blow out the lamps. The first one out, I approached the second lamp for the dramatic conclusion of the play. The extinguishing of the flames represents a finality, a resolution, a completion of Leopold’s ghost visiting his shack and learning his lesson. I could hear the murmurs in what had been, for an hour, a pin-drop quiet audience. I paused, my back back to the audience, and considered the moment. This is when I usually begin to tear up as I extinguish the last flame and let go of the book my character has been clutching tightly for forty-five minutes. I would have to trust the audience. They had made it this far with me, even in the darkened house. I had to believe that they didn’t need that final dramatic act to seal the deal. I left the flame burning, and left the stage, disappearing into the darkness. Arousing applause brought me back to the stage, but the Q&A was reduced to one long answer to one short question. Some folks headed straight for the door, but a line of people waited to purchase Sand County Almanacs, many of whom even took the time for me to sign them by lamp light. 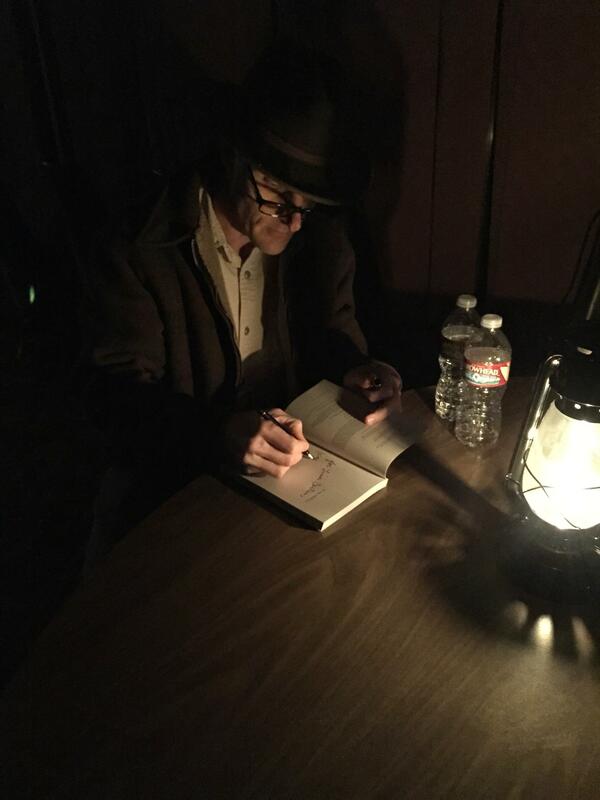 After most of the crowd was gone and I had gathered my things and donned my coat and hat, one last audience member requested an inscription. Vincent, who had been so helpful during setup, saw the scene, grabbed his camera, and snapped off a quick shot that well captured the spirit of the evening. Our Sunday outing was cancelled due to the weather, and between a delightful four-and-a-half hour breakfast conversation with a core group of folks including festival organizers John Koshak and Vince, and an equally engaging dinner with some of the same folks, I spent a relaxing day at the hotel that included napping, television (my guilty hotel pleasure), and a long hot bath. At 5:00 the next morning, I began the long drive back to the Colorado Springs airport for my journey home. The reverse trek on Thursday night had been entirely in the dark, the unmistakable smell of feedlots being the only clue to my surroundings along the way, and though I looked forward to at least a little light on the return, I began this trip an hour-and-a-half before sunrise in the same darkness. A mere fifteen miles in, as I carefully navigated a road patch-worked with ice and snow, what might have been seen as an omen brought travel to a stop. A semi had slid through a turn, coming to rest with its cab off the road in a shallow ditch, and now a tow chain blocked the road in front of me. Twenty minutes later the big rig once again had all eighteen wheels on the road and was able to continue under its own steam. As a small line of pre-dawn traffic slowly made its way westward, a black-tailed jackrabbit who was certainly unaware of the omen watched from the sideline. For the next four hours, there was no point it checking the speedometer as road conditions necessitated slowing, speeding, and slowing again but never allowed nearing the posted limit. Eventually I hit Pueblo where I looked forward to a snow-free and flowing Interstate 25 north for the final hour of my road journey, only to find my hopes dashed. The Interstate along the front range was covered in snow, and traffic crept at 30 miles per hour all the way to Colorado Springs where I found the road to the airport completely unplowed and untreated, slowing progress even further. Fortunately, there was little traffic to COS and I snailed my way west with only the occasional spinning tire, and parked in a snow-filled rental return lot at a ghost-town of an airport. A couple hours later I was on a plane for Dallas, TX–a city under siege by an ice storm. Somehow, in spite of several delays and two reschedules, at 7:45 p.m. I cracked open a beer somewhere between Dallas and Charlotte and could smell home on the horizon. It would be another four hours before the plane door opened in Chattanooga, and around 2:00 Tuesday morning I finally made it to bed. When I awoke six hours later, I looked out the window to see (you guessed it) snow on the ground. I think the good folks of Lamar might have been right. It is following me. As grits simmer on the stove this morning, I am happy to be home with fond memories of the high plain. Here in the South we pride ourselves for our hospitality (bless our hearts) but I have to wonder if given the same conditions–heavy snow, power outage, a demanding visitor from afar–we would carry ourselves with the same genuine smiles as the folks in Lamar, CO where there is no sugar in the tea, no alcohol in the restaurants (at least the ones I visited), and an expectation of prolonged oppressive winter weather. The inch of snow we complained about here will surely be gone tomorrow, but in Southeast Colorado folks will be greeted by another storm piling more snow on top of more snow, and I suspect folks will be smiling as they shovel their walks and plow their roads. And hopefully they will put out some seed for a little yellow house finch. With any luck, I will make it back some day.